Evil Islands (also known as Evil Islands: Curse of the Lost Soul) is a role-playing strategy video game developed and published by Nival Interactive. Evil Islands introduces a new interface and full 3D graphics and it combines role-playing, stealth, and real-time strategy. Evil Islands was published in October 2000 in Russia and CIS (Russian version) and in February 2001 in English. 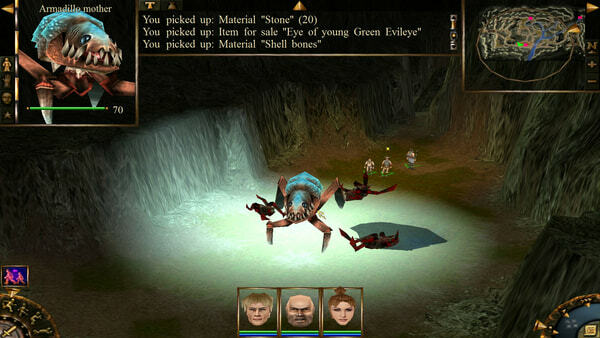 Welcome to an unprecedented blend of radical RPG and serious strategy. It’s cunning against savagery and steel against magic. It’s 80 mind-bending quests in an ever-changing 3D world. It’s 300 vicious manifestations of pure evil. It’s the unique power to create deadly spells and awesome weapons from the spoils of your adventures. It’s flexible, multi-skill character development. It’s stealth, treachery and fierce combat set in a dark, rich storyline. It’s Hell to pay. We call it Evil Islands. You can call it home for the foreseeable future.